Cat lovers! You won’t find disaster here. In fact, far from it. 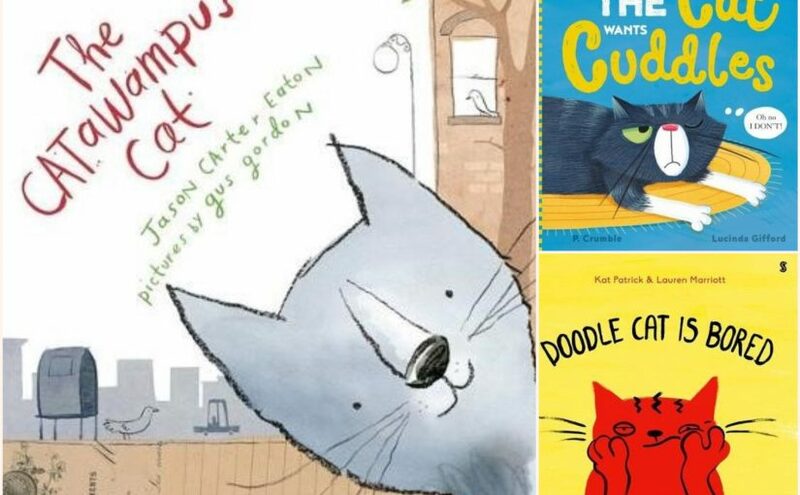 These following cat books are brilliant enough to stretch your imaginations, tickle your sweet spots and scratch at your curiosity. And they all so precisely capture the little nuances that make cats, cats. 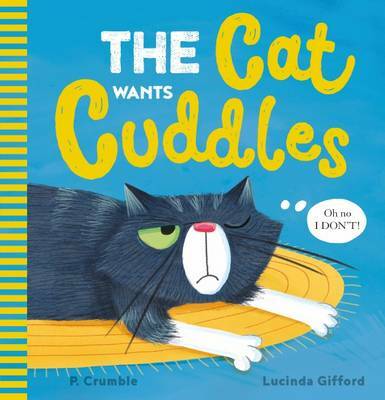 In this sequel to The Cat Wants Custard by dynamic duo, P. Crumble and Lucinda Gifford, The Cat Wants Cuddles delights us with humorous cat antics and extreme mood swings. Whether being notoriously independent, totally ambivalent or attention-deprived, Kevin is a typical tomcat. Surly facial expressions and skittish body language emphasise the stubborn and scornful retaliation Kevin assigns to his owner’s requests for a cuddle. Managing to escape the torturous grip of patting hands, and with absolutely no regard for his flatmate, Dog, Kevin finally finds some peace and quiet. That is until a wave of jealousy rushes over him and he commands dominance over Dog for his former lap-position… but that doesn’t last long! This book is decidedly potent with its bold, primary-based colours and energetic qualities that exude passion and wit, especially those lime-green, telling eyes. The Cat Wants Cuddles is a book that preschoolers will be snatching, cradling and squeezing with both paws. The Catawampus Cat is full of personality and individuality, and utter charm. Jason Carter Eaton writes a thoughtful and witty tale that inspires his readers to consider the world from a different perspective. Gus Gordon’s mixed media illustrations are characteristically charismatic and ooze with a sway of retro style and a hint of contemporary flair. The characters are flawlessly represented to match their quirky names and traits that Eaton so brilliantly describes. When the catawampus, aka diagonally-angled, cat enters the town on a Tuesday morning, one by one each of the villagers see things from another point of view. Because of the askew-walking feline, lost possessions are found, relationships rekindled, creativity is sparked and new challenges are triumphed – all with thanks to the power of the tilt. Soon the whole town is lopsided, and they even mark the first Tuesday of the new year as “Catawampus Cat Day” in his honour. But all the cat wants is to be unique, so he sets off… ‘straight’ out of town! Eccentric, memorable and thought-provoking with the most loveable and endearing character. 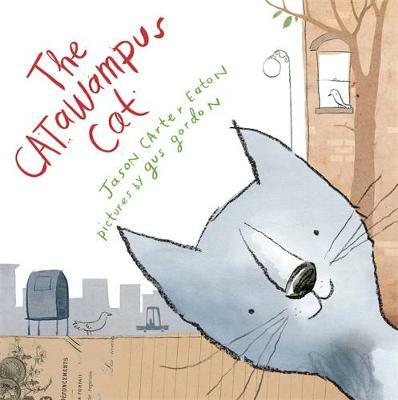 The Catawampus Cat will be the new favourite for preschool and early years children…it’s ours! Penguin Random House, April 2017. Kat Patrick writes this story with bounce, energy and vitality. The sentences are simple to create an interactive yet highly amusing report from the view of the cat. Lauren Marriott’s illustrations reflect this beautifully. 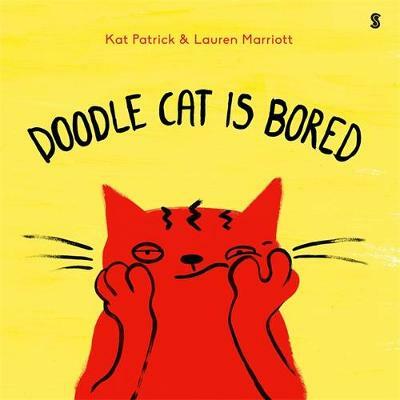 Her choice of fire engine red perfectly assigns Doodle Cat his prominence on the mostly plain white backgrounds. She has also introduced the front cover’s lemon yellow, which features sporadically within the pages, too. Young children will certainly be ‘drawn’ to both the simplicity of the book but also the scope of curiosity and artistic opportunities it reinforces. 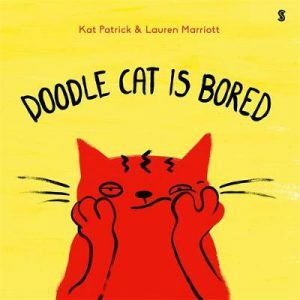 Doodle Cat is Bored is bursting with ideas to quell those boredom blues. What is it about mischievous, strong-minded animals that make them so irresistible? Is it because they are so entertaining, or that we can see ourselves in them, or both? 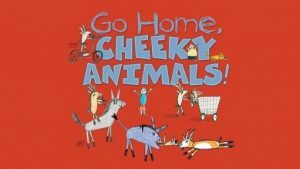 Here are some of the latest picture books that fit the bill in the ‘cheeky-animal’ category. Get your paws on them now! 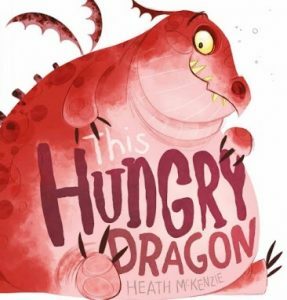 Heath McKenzie whets our appetites with the introduction of his sweet little rumbly-tummy dragon. But ‘This Hungry Dragon’ doesn’t stay little or sweet for long! Each page turn will have you in stitches as the red beast grows hungrier, and rounder, with every humungous gulp. Now bigger than a house, perhaps there’s room for one last little mouse, and a doctor to make him feel better! But it’s the dragon’s undoing when the doctor comes up with a ‘rockin” plan to escape from the animal-gorged belly. This fabulously hilarious, rhyming read-aloud story encapsulates all the goodness of a buffet feast, from its choice vocabulary to its rollicking rhythm and exuberantly playful line and watercolour illustrations. Delightfully delicious for preschool-aged children. I love the child-like energy in the whimsical pictures by disabled Indigenous illustrator Dion Beasley that accompany the satirical, first-person perspective written by Johanna Bell in ‘Go Home, Cheeky Animals!’ (sequel to highly acclaimed ‘Too Many Cheeky Dogs’). Arms are a-flapping when goats, donkeys, horses, buffaloes and camels invade the property at Canteen Creek, but the naughty canines simply stretch and go back to sleep. When the family have finally had enough, the lazy dogs come to the rescue and growl in their loudest, angriest voices, “GO HOME, CHEEKY ANIMALS!” And they do…or do they? This author and illustrator combo marvellously bring a sense of familiarity and understanding to a most inconvenient, yet comical situation based in the Northern Territory. Recommended to all lazy dog lovers out there. 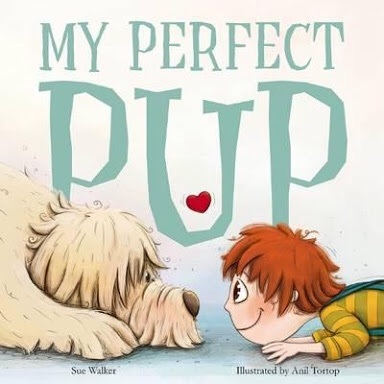 With all the fun of caring for a new pet, with the added bonus of humour, what makes a real friendship, and adorably energetic illustrations, ‘My Perfect Pup’ is the perfect book to select for your young reader. New Frontier Publishing, June 2016. Now here’s a pet with personality; it’s the red cat in ‘I Am Doodle Cat’ by Kat Patrick and Lauren Marriott. Doodle Cat, seen full-focus in a series of animated positions on plain backgrounds, is not shy to let us know about all the things he loves. Dancing, the ocean, farts, friends, maths, lentils, fractals, difference and doodling are some, to name a few. But most importantly, Doodle Cat loves himself, in the best way possible. Simple, visually friendly red and black on white illustrations suitably marries with the message of loving the simple things in life. 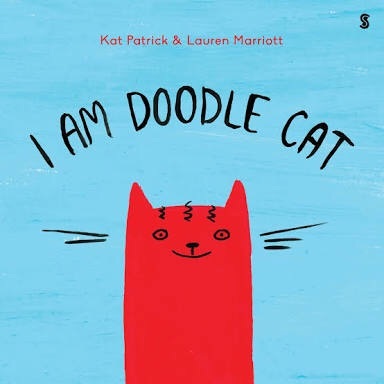 ‘I Am Doodle Cat’ is also witty, candid and thought-provoking, making it a engaging read for preschoolers and beyond. Scribble / Scribe Publications, March 2016. 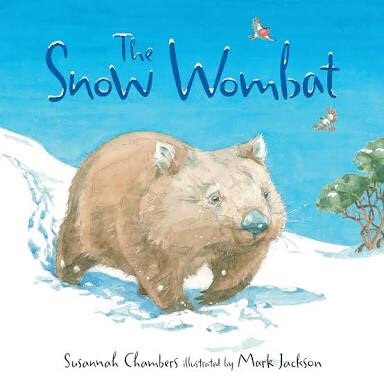 It’s cuteness overload in Susannah Chambers and Mark Jackson’s ‘The Snow Wombat’. Wombats are well-known for their cheeky, playful personalities, and this one is no different. Fun, rhyming couplets allow its preschool readers to make predictions and interact with the story. The wombat ventures through the ice-laiden countryside, lapping up all snowy goodness around him, and ‘on’ him. Finally, he finds a dry, warm place to snuggle in for a snow-free sleep. The illustrations portray breathtakingly beautiful scenes and precisely depicted human and animal characteristics. ‘The Snow Wombat’ captures a wonderful preview of recreational fun in the snow and an Australiana feel. Allen & Unwin, June 2016.